The history of the building in which the apartment on the second First floor and attic is located, dates back to the 15th Century. At the time, here the forester of the castle was located. The house is located in the old town close to the Holy Spirit Church, the town hall and market place and at the outer edge of the pedestrian area. Thus, it provides all the advantages of the city with respect to tourist destinations, restaurants and other activities. Since the apartment is located in a quiet side street, it is really quiet. The unique location of this apartment allows a view of the famous Heidelberg Castle, which can be admired both from the balcony from the living room and bathrooms as well as directly from the bed. The apartment was renovated completely until May 2014 and connected to district heating in March 2014, so they. Ancient walls with the amenities of 21 Connects century. The apartment is high quality and modern and fully equipped. You have the ability to view the entire apartment with approx 130 sqm spread over 2 levels (up to 6 people) to rent or only the lower floor with 80 sqm (for up to 4 people). For details, refer to the rental rates. The two beautifully designed bathrooms are characterized by heated floors and a host of facilities: WC, bidet, large shower, large sink with mirror. Included in the rental is the use of high-speed internet, towels, bed linen and tea towels. A small selection of coffee cups (Tassimo) is available for the launch. The bathroom 1 is located on the lower floor and is modern and high quality. Underfloor heating, natural light and also lock look round the well-being. The bathroom 2 is in the attic and also equipped with amenities such as bathrooms 1. Upon request we provide a baby cot. You can also book a cleaning service. Wonderful apartment in a great location, right in the middle of the old town, comfortable and relaxing. The property was perfect with views of the Castle and right in the middle of old town. We absolutely loved it and look forward to staying there again. 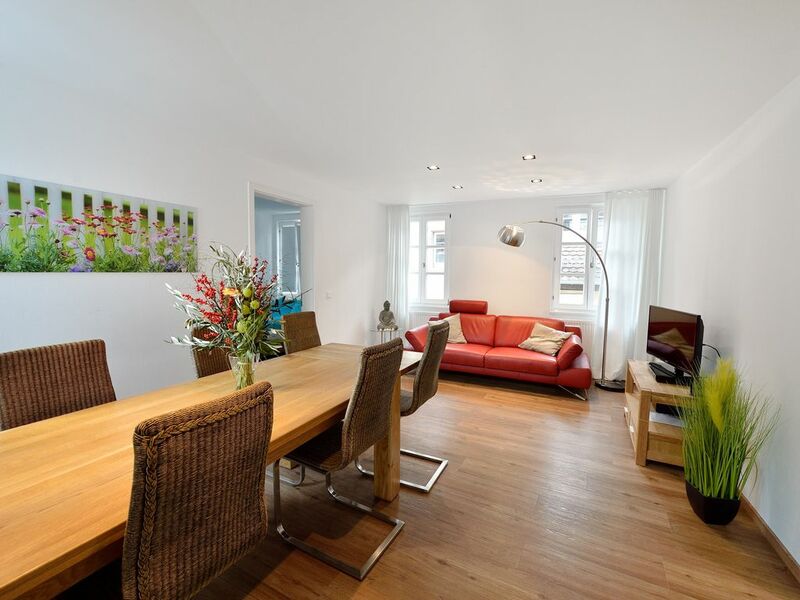 Great location on a quiet street in the middle of the Altstadt. Arrival and departure easy and well managed. The apartment is new and clean and well-appointed. We had everything we needed for our 6 day stay. This third-floor apartment in the heart of Altstadt Heidelberg boasts a spectacular view of the castle from the terrace. It extends over 2 stories, with the roomy loft the most comfortable bedroom, and offers two other bedrooms, two full bathrooms, and a well-appointed kitchen, as well as a large living area. This will make you feel like you live in beautiful Heidelberg permanently! This is worth the price. Highly recommended. We stayed in this lovely apartment for a week. Very central location - less than one block from the Marketplatz and the church. The balcony has a beautiful view of the Schloss. Note for American travelers - the apartment is what we would consider the third floor. The steps are a bit narrow and sometimes hard to navigate with bags - but that's because the house is fairly old. Nothing you can do about that. I would also recommend that anyone driving, just map your route to the Hotel Am Schloss which has the best parking (and is two blocks from the apartment). We didn't realize the apartment is on a street you can't really drive down so the GPS wasn't giving very good directions! The house is located in the old town close to the Holy Spirit Church, the town hall and market place and at the outer edge of the pedestrian area. Thus, it provides all the advantages of the city with respect to tourist destinations, restaurants and other activities. Since the apartment is located in a quiet side street, it is really quiet. The unique location of this apartment allows a view of the famous Heidelberg Castle, which can be admired both from the balcony from the living room and bathrooms as well as directly from the bed. Mountain Railway which runs to Heidelberg Castle, and the nearest bus stop is 1-2 minutes. Here is also the nearest car park. The nearest motorway exit is only a 10-minute drive to the train station and they can take a bus or taxi in just 5 minutes. To lock, you can also run in about 15 minutes (very nice way). Many restaurants and shops are nearby. A grocery store and bakery are within 2 minutes walk. In a few minutes you are at the old university, several museums, the Neckar with excursions into the Neckar valley and many other attractions. Out of Speyer and Schwetzingen are possible within 20-30 minutes drive and worthwhile. Die Umsatzsteuerausweis in Höhe von 7% wird auf Wunsch im Vertrag ausgewiesen.